﻿When school started again, we settled into the routine of classes but continued to hang out together after school, usually at Kathy's house. One day we wandered out to a fenced-in back lot that was full of lumber and wood scraps. Kathy's parents used the lot to store leftover materials from a large addition they recently built for their growing family. 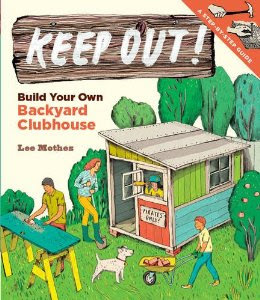 The yard was a weedy mess but we decided it was a perfect place for a new clubhouse! The best location was a spot next to the fence, where no lumber was stored, but where a huge pile of cut-off blocks and scraps of wood had been tossed during the construction. We spent a Saturday clearing it all out, and we saved a few usable boards that weren't yet termite-eaten! We had a clubhouse site! So every day I went back there after school, and with Kathy or Chris we started building. 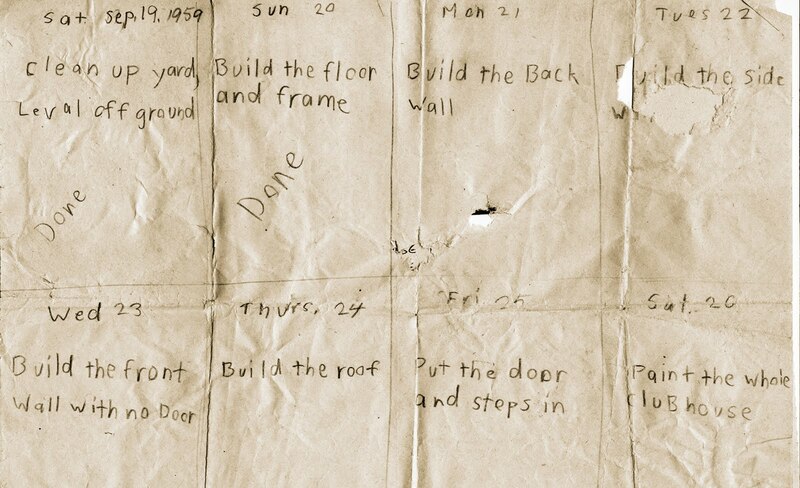 As the construction progressed, I drew the schedule-of-progress, above, and another after-the-fact plan, below. the line at left, which saved us a lot of wood. Some of the stored lumber, none of which we were allowed to use, can be seen on the right. and then including them in the plan! After the clubhouse was trashed, Chris and I teamed up with the girls who threw the rocks that day. We'd actually known each other for a while so why not? It turned out that the four of us were good at organizing day-long expeditions. We packed lunches and a first aid kit, and were drawn to forbidden or not-for-children destinations, and there were plenty of them. Our parents routinely told us to "go outside and play!" right after breakfast and were content if we remained outside until dark as long as we let them know where we were...and we took a few liberties on that one. For instance if we told them we were going on a hike to Tin Can Beach, we neglected to add that we would be taking a detour to the old World War II gun emplacements nearby. 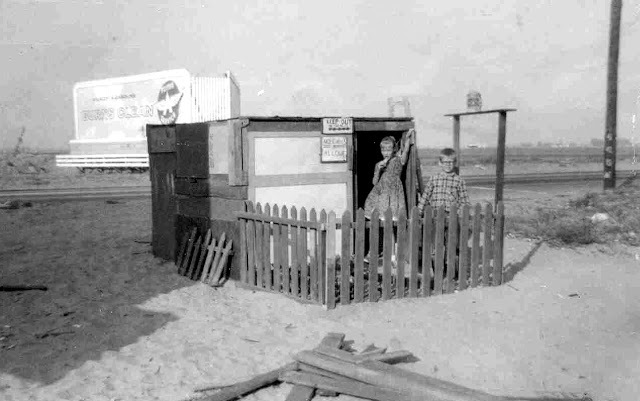 Tin Can Beach, a mile away toward Huntington Beach, was two miles of open sand littered with old bottles and rusted cans from years of people camping and squatting there in tents or cardboard shacks, sometimes all year! Now it is known as Bolsa Chica State Beach - all cleaned up and mostly parking-lots. 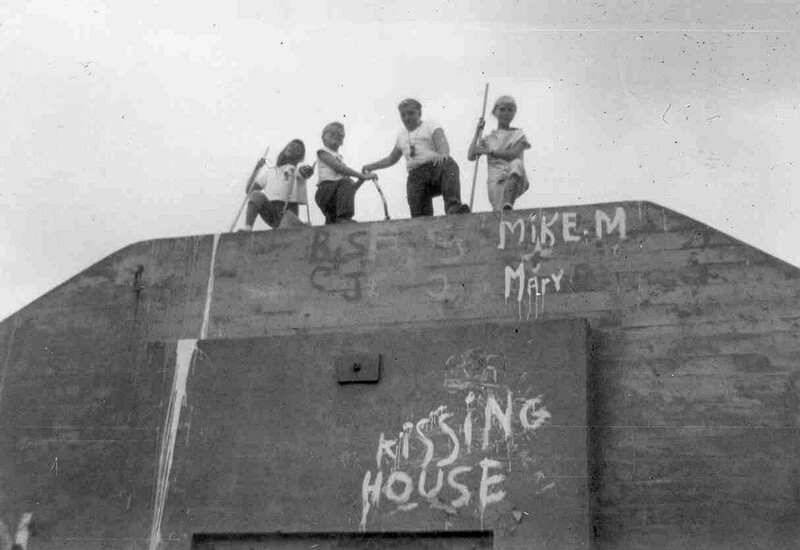 About a half mile inland was a fenced-off group of abandoned concrete bunkers, tunnels and gun turrets (no guns) that the Army installed to defend against Japanese warships. That was our real destination! We walked the length of Sunset Beach, then wandered up to and easily under the barbed wire to find a natural wonderland of grassy fields, old eucalyptus trees and singing meadowlarks, and then the bunkers. We had heard they were very dark inside so we brought flashlights and made our way through the tunnels. All we found was grafitti and trash, but it was like another world - and creeeeeepy! Satisfied, but still nervous, we made our way back to Tin Can Beach and ate our lunch! 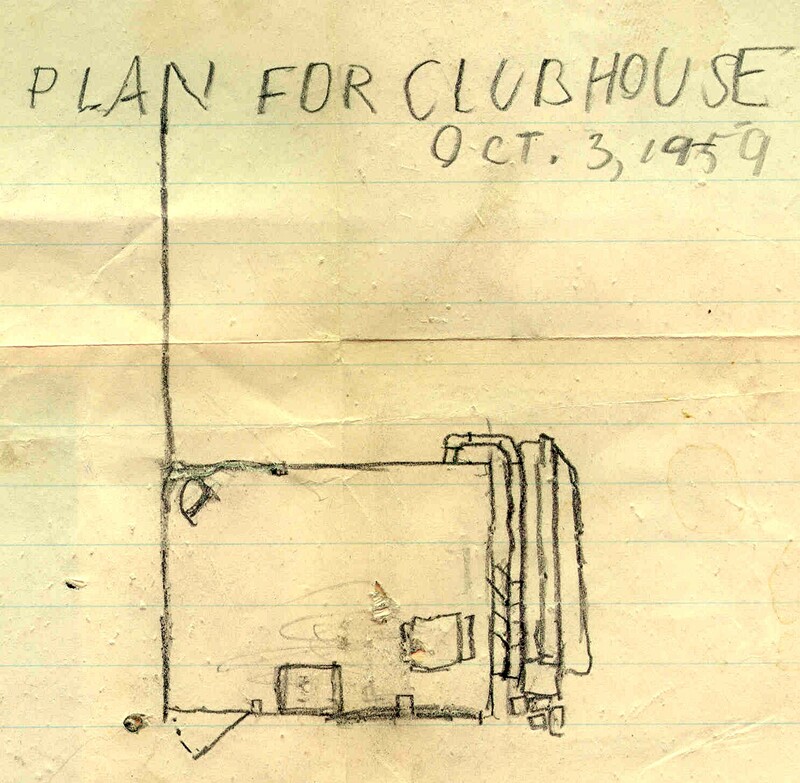 In 1959 I was 11 years old and decided I wanted a real clubhouse made out of wood. My friend Chris did too and we spent several weeks building this one, our first sucess, at least for a while. I borrowed some tools from my mom and neighbors gave us the fence and the white cabinet doors that made up some of our walls. The rest of the wood we hauled in on our wagons. Chris and I also found lots of stuff in the alleys to furnish it, including an old car seat for a couch, a teapot and a mantel clock. 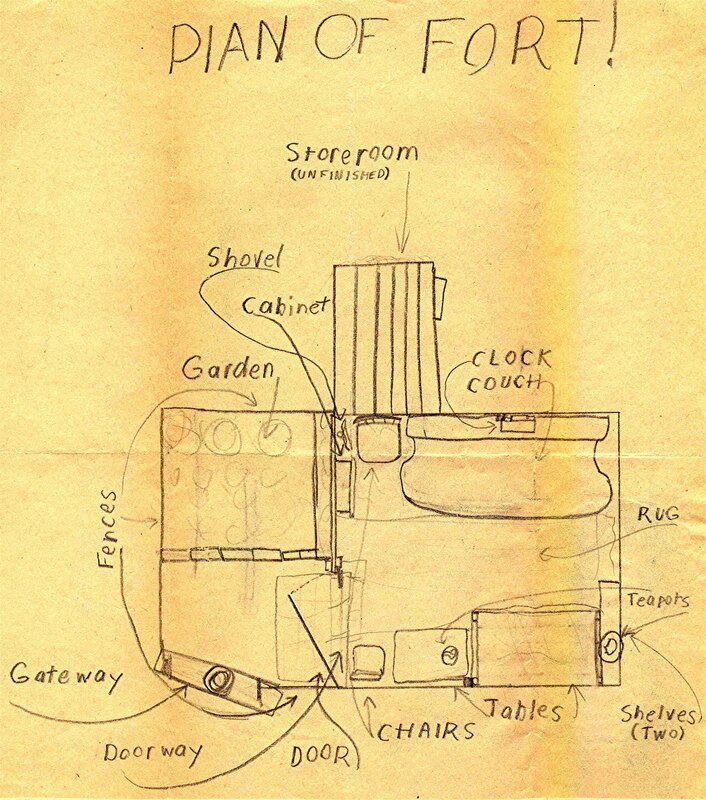 I drew the plan below after we had been in it a while. Since we built it on a vacant lot, it soon became a target of other kids in the neighborhood. Some girls we knew did NOT like the "No Girls Allowed" sign we put up by the door, and they attacked us with rocks one day until we promised to take it down! One day I noticed that the old clock I'd found looked a little funny, and when I picked it up it crumbled into pieces. 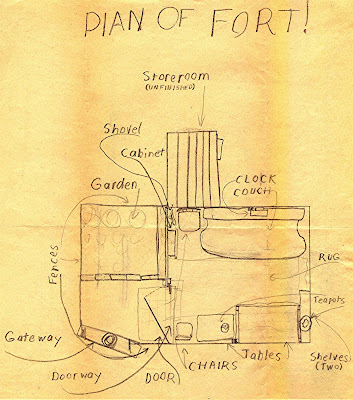 Later, a kid named Brian cheerfully admitted he blew it up with a cherry bomb, then put it back together! A few weeks later Chris and I found the clubhouse totally wrecked, by a certain gang of 3 boys who lived several blocks away... To be continued.